5.3 liter V-8 Vortec Gen III 301 H.P. 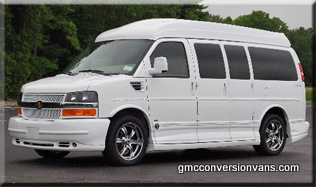 For more information about Chevrolet conversion vans contact one our experts at 1-866-975-3287. Arbogast the largest selection of new and used conversion vans in the United States. If you don’t see exactly what you’re looking for, we can custom build a van in as little as two weeks. The Arbogast team can deliver your new van to your home or fly you into our local airport. We take the hassle out of buying a conversion van online!